For a secure restoration that helps to maintain the structure of your jaw, come to Vernon Woods Dental and Implant Center for dental implants. Our dentists will place a titanium post that supports your jaw bone as well as the natural-looking crown we set on top. Call Dr. Tantuco and Dr. Chong if you are interested in learning more about the benefits of dental implants in Sandy Springs, Georgia. 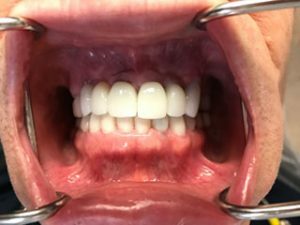 Patient had a removable partial denture for the upper arch and bite collapse. We did 7 implants in the upper arch and made a fixed, implant-supported bridge. We also opened the patient’s bite with crown lengthening and dental crowns on the lower teeth.